I've brought you recipes and food ideas in my posts, but I'm going to try to bring you a series where I bring you one recipe per week. These will be recipes I've created at home myself and will follow clean eating principles such as no white flour, no fake sugars, no preservatives or artificial ingredients. Its going to be clean and fresh recipe ideas. 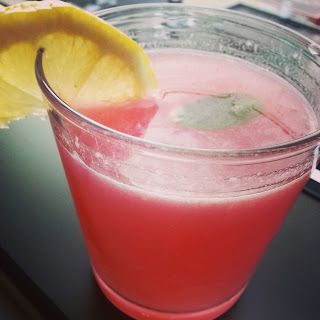 I thought this pink lemonade was so fitting for the Fourth of July holiday. It is refreshing, healthy and your guests will love it! TIP: How do you remove the seeds from a pomegranate? To remove the seeds from a pomegranate, I slice it in half and then I slice smaller slices from that half. It usually ends up being 5-6 slices. I just pull the seeds out from the meat of the fruit into a bowl. When you get to the ends you can just turn the inside out. I don't find you need to soak them in water to get them out. Its pretty simple and kind of fun. It's a good activity to have a kid help out with, they seem to be fascinated with it (but do it in a safe area!). Be careful because they will stain everything! I usually eat in the kitchen and wash my hands while eating and have an area cleared out and an apron or dark clothing on! Newspaper would work well outside on a nice day too! I'm absolutely addicted to these! Feel free to pin and share this recipe with credit. This recipe may not be republished or reprinted by a commercial website or website that generates revenue in any form without express permission from InTruBeauty. 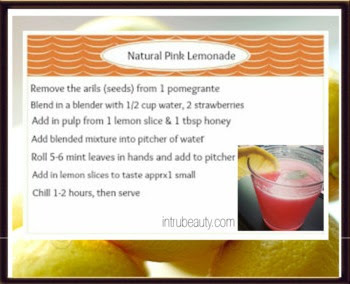 Please contact me at intrubeauty@gmail.com if you would like to discuss publication of this recipe.